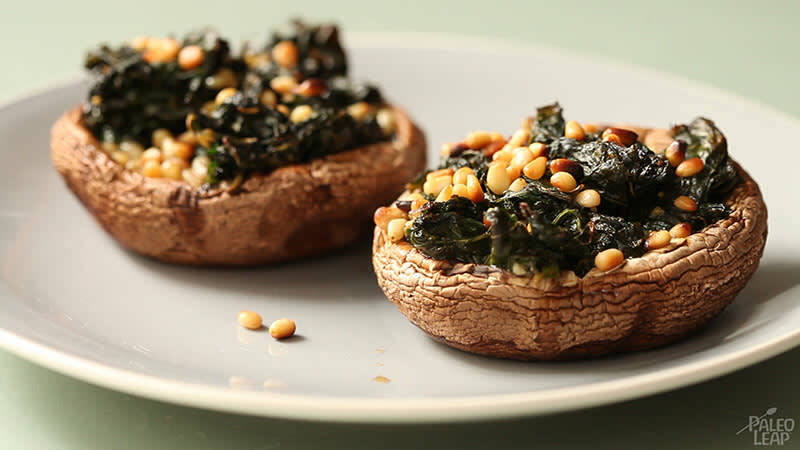 We love stuffed mushrooms. In fact, we relish them so much that we’ve taken it upon ourselves to sample and eat them all: sausage-stuffed, crab-stuffed, pesto-stuffed, bacon-wrapped and stuffed mushrooms, and sometimes we even go so far as to stuff the mushrooms with apple into a rolled pork loin. Any way you choose to stuff your mushrooms, it will definitely make a great Paleo meal. You can also make it Paleo-Vegan as well, by omitting the butter and using coconut or olive oil instead. The recipe is so uncomplicated that you can adapt at a moment’s notice, proving once again that creativity in the kitchen is possible for every food demand. You might have heard it before, “don’t crowd the mushrooms”. What happens when they are too close together is that they won’t brown properly, they will simply steam (absorbing fat from the pan and releasing their juices). We aren’t so concerned with this aspect of cooking mushrooms here, though it is good to remember down the line. What is important, however, is that they are thoroughly clean before using. Because they absorb water like a sponge, which will change the texture while cooking, it is best to wipe them with a damp paper towel, or to use a small brush to wipe off any dirt, rather than soaking them in a bowl of water. What to serve stuffed mushrooms with? Balsamic tomato and onion salad for starters, perhaps with a slice of roasted garlic-mustard pork on the side? Pre-heat oven to 390 F.
In a large pan melt the butter with the garlic and sauté for a few seconds. Add the spinach and allow to wilt. Add the lime juice and season to taste. Place the mushrooms in an oven-proof dish and season with salt and pepper. Add a generous spoonful of the spinach mixture to each mushroom and top with the pine nuts. Place in the oven and bake for 15-20 minutes until the mushrooms are cooked through and the pine nuts are golden.